Der Artikel Camilla Tilling - Rote Rosen (Lieder von Richard Strauss) wurde in den Warenkorb gelegt. Richard Strauss, the great composer of symphonic poems and grand operas, wrote solo songs throughout his life: his first compositions, performed within his family circle, were songs and his setting of the poem Malven (Mallows) was to be the last piece he completed. Taking a keen interest in the possibilities and limitations of the human voice, Strauss in the solo song genre found the opportunity to try out various musical options and to discover his own individual style. But the writing of songs also served as a form of relaxation, a way of passing the time. The result is a varied spectrum of atmospheres, moods and emotions: from the jesting tone of Hat gesagt — bleibt’s nicht dabei to the heart-felt declaration of love in Cäcilie and the portrayal of madness of the Three Songs of Ophelia. Camilla Tilling, whose successful opera career in a very short time has taken her to some of the world’s most prestigious venues — including Covent Garden, the Metropolitan, La Scala and La Monnaie — made her international breakthrough in the role of Sophie in Strauss’s Der Rosenkavalier. Ever since, Strauss’s music has held a special place for her, and on her first solo recording she has chosen to perform some of her favourites among his songs. She is partnered by the fine German pianist Paul Rivinius, with violinist Ulf Wallin making a guest appearance in Morgen!, where he plays the solo that Strauss added when making an orchestral version of the song. Stereo 06 / 09: "Mit glasklarer Tongebung und auch in den Höhen sicher geführtem Sopran, mit zuverlässiger Stimmführung auch bei kleinen Trillern, mit perfektem Legato und mit Mut zum Spitzbübischen (wie in 'Muttertändelei'): Camilla Tilling hinterlässt auf ihrem ersten Solo-Album einen überragenden Eindruck. Gestalterisch intelligent, technisch perfekt singt sie 21 Richard-Strauss-Lieder, die ihr wie in die Kehle komponiert scheinen." 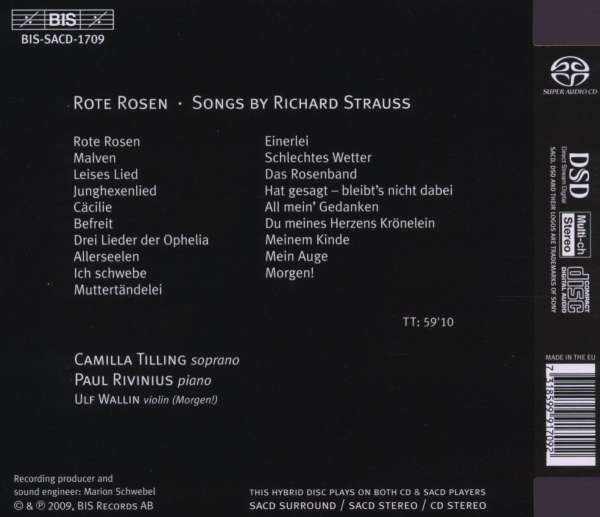 Hörprobe Track 1: Rote Rosen (Weißt du die Rose) o. op. Hörprobe Track 7: Nr. 1: Wie erkenn ich mein Treulieb vor andern nun? Nr. 1: Wie erkenn ich mein Treulieb vor andern nun? Hörprobe Track 21: Nr. 4: Morgen!